VSL #3 was designed specifically to help IBS, IBD, and Ulcerative Colitis sufferers. The probiotic supplement is one of the most efficient ones on the market, and it works not only for GI related conditions, but for many other inflammation related disorders. First of all, when we compare probiotics, we need to compare apples to apples, and make sure we understand what a specific strain of probiotics can do for our health, and what other options are on the market. This is rather difficult, because FDA did not approve any probiotics as drugs, so any health claims have to be within the approved frame for supplements. There is an initiative to change that, but it could take a while until it gets implemented. This means that the efficacy of probiotics for treating certain conditions can only be suggested. That’s why you don’t see any probiotics manufacturer making claims. VSL 3 makes no difference, they have to abide the rules. So how do we know if a probiotic supplement is good, and what conditions it treats? There are a couple of reliable sources of information, besides the suggestions made by the manufacturer. The scientific literature about all the strains in the probiotic blend tells us what the product was designed for. This is a reliable source of information, based on scientific evidence. Then, there is the anecdotal evidence, and the product ratings. People will also vouch for a product when it helps them. The reviews and the ratings of probiotics are a key marketing approach. Ratings can be manipulated, and we can't rely 100% on them, but it's easy to see if a review is fake, and VSL doesn't seem to use this type of marketing. Why Is VS #3 One of the Best Probiotic Supplements? Back to our review of VSL #3, let’s see what makes it so efficient. Their capsules contain 112.5 billion live lactic acid bacteria. They claim their product is the probiotic supplement with the highest CFU count per unit. This is one of the few factors that will dramatically affect efficiency of the probiotic food supplement, to use the FDA naming convention. The sachets from VSL3 contain 450 billion live bacteria. That is impressive. As much as I love this product, this is just a marketing hype. What stops you take more capsules, or sachets with half, or third of the CFU count? If the price is right, and the CFU matches the advertised one, you can buy another product and take three capsules, instead of one. On the other hand, many people will stick to the serving size, and in most cases the serving size is just too low to have an impact. As a matter of fact, Sigma-Tau, the VSL3’s manufacturer, strongly advises to talk to a doctor while taking their probiotic. That is because at high doses, there could be serious side effects for patients with low immunity; more about side effects later. Another factor is the number of live probiotics at the time of administration. Most companies will list their CFU count at the manufacturing time, which is safer to declare, because bacteria can easily die during transportation, or on the shelf. VSL #3 is freeze dried, and the technology allows bacteria to survive without food. VSL 3 should last through "best use by" date and even longer at refirgeration temperatures, that is 39-46°F, or 4-8°C. Once the bottle is opened though, it is recommended to take it without interruption, and keep it in the fridge. If you order by Internet, it is safer to choose the expedited delivery. The manufacturer instructs the resellers to respect the refrigeration requirements, and to educate buyers about properly storing the product. The product is shipped with a cold pack, if you don't receive it with a cold pack, refuse the package. The bacteria should survive for up to two days at normal temperatures, but it is safer to avoid as much as possible the exposure. The VSL#3 capsules contain 112.5 billion live bacteria each. The bottle contains 60 capsules. 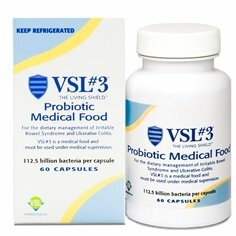 VSL #3 is a potent probiotic medical food, and it has great reviews on Amazon. In order for it to be effective, it need proper storage, at the correct temperatures. This seller stores it in a refrigerator, and ships it in a cold pack. This is the best way to ensure bacteria viability. I recommend you to choose the expedited shipping, as it is safer, even if the seller uses a cold pack. Track the package, so you can pick it up on delivery. You don't want to leave it in the sun for a few hours, even if it has a cold pack. The blend of probiotics is a combination of lactic acid bacteria with various roles in your treatment. Some probiotics can reduce the pathogen bacteria and yeasts in your gut, some balance your intestinal ph, and some reduce inflammation. There is not enough research to know exactly what the optimal dose is, but it seems like VSL#3’s formula hits the sweet spot. Bifidobacterium infantis – Reduces the intestinal permeability, and it is involved in production of serotonin. Lactobacillus acidophilus – Reduces cholesterol, fights pathogen microorganisms by secreting bacteriocin CH5, and keep the opportunistic bacteria in control. Acidophilus also boosts immunity, and reduces symptoms for various intestinal conditions. (http://en.wikipedia.org/wiki/Lactobacillus_acidophilus). It is believed that Lactobacillus acidophilus can populate the gut. Streptococcus thermophilus – Decreases leaky gut symptoms, helps lactose digestion, immunity booster, fights pathogens, reduces inflammation processes. During culturing, dairy is used to feed the bacteria. During manufacturing though, these are removed. Extremely low traces of dairy might still be present in the product, but that amount is so low, that it should not be affecting anyone. The sachets version of the VSL #3 contain 450 billion active bacteria, and a total of 30 sachets per box. This makes it the supplement with the highest CFU count in the industry. The Amazon seller states that the product ships with an ice-pack, which is the right way to ship, and they also recommend to chose expedite shipping during the summer time. Is VSL #3 Effective for IBS, IBD, and Ulcerative Colitis? Is VSL 3 effective for gastrointestinal disorders? The short answer is yes. There are a lot of gastrointestinal disorders, many of them very little understood. However, in the latest years scientists were able to realize that many of these ailments are caused by a poor balance of the intestinal microbiota. IBS, Ulcerative Colitis, some types of Chron’s disease, are now linked to a disturbed microbiota. Microbiota can be disturbed with administration of antibiotics, or because of a poor diet, or other causes. Once disturbed, pathogens and opportunistic microorganisms take control, and the normal microflora changes. Pathogen microorganisms produce abnormal changes in our bodies that help them multiply and thrive. One of these changes is inflammation. More explanations about how inflammation helps pathogens thrive here. There is little chance to recover without help, once the mechanisms are in place. The classic treatments for IBDs are corticosteroids, immunosuppressors, antibiotics, etc... Corticosteroids and immunosuppressors only treat the symptoms, by reducing the inflammation, but the underlining cause, the pathogen is still active. Antibiotics kill all bacteria, and this should help temporarily. The problem with this approach is that antibiotics kill all bacteria, bad or good. So at the end of the antibiotic administration all the microflora is destroyed, leaving the body without defense against pathogens. In fact, antibiotics might have been the cause in the first place. VSL #3 formula contains 8 lactic acid bacteria, selected specifically for their ability to reduce inflammation, to reduce intestinal permeability, (leaky gut), and to fight pathogens. Looking at the active ingredients list, we can see that this probiotic blend is a selective antibiotic, an anti-inflammatory, and a treatment for intestinal lining healing. What makes this product special though is the amount of bacteria per unit. If you look at the list of probiotic supplements, you can see that VSL #3 is the product with the greatest biodiversity, (8 strains), and the highest CFU. There are a couple of products that are close to VSL3 in terms of number of live bacteria, but more expensive per unit. What makes VSL #3 really stand out, is the specific blend. The 8 lactic acid bacteria, combined in the specific ratio, is the one that works the best. More than that, it contains only 100% safe strains. There are probiotics that in extremely rare cases, in certain conditions, can spread into body areas where they don’t belong. VSL3 doesn’t contain any of those strains. This is one of the most researched probiotic supplements, and all the studies proved, or at least suggested its efficiency. Sigma Tau Pharmaceuticals did their home work with this product, and the results are thousands of people happy. I thought I would touch on this, since many people have a hard time understanding some of the changes while taking this probiotic. VSL #3 is not like any other probiotic, because of the massive amount of probiotic organisms, needed to make a visible change, there can be consistent side effects. One side effect is a consistently more urge to go to the toilet. You will go there more often than usually, but this is a good thing. It just annoys people who are not used to it. You can even get diarrhea at first. Don’t discourage, is normal. Another side effect is gas and bloating. You can get serious abdominal pain, and Sigma Tau, for obvious reasons, doesn’t make this very clear for customers. They kind of mention it, but that’s all. The best thing to do when you have too much gas or abdominal pain is to reduce the dose. You probably need a week or two to adjust the dose to what you body needs. For some people can take even longer. The gas is normal when you change the intestinal microflora. It is a consequence of readjusting the balance of the intestinal microbiome. After the adjustment period, the side effects should subside. The side effects are one of the reasons Sigma Tau recommends people to talk to a doctor before taking this. A doctor supervision while taking VSL#3 is the best course of action. However, many physicians are not familiar with the product, and they will be reluctant to recommend it. There is no doubt that VSL #3 is efficient for treating IBS and Ulcerative Colitis. There are numerous studies, and this is probably one of the most researched probiotic supplements on the market. The product from Sigma Tau Pharmaceuticals has the highest dose of probiotics to begin with. This is one of the factors contributing to its efficiency. However, the scientific studies suggest that the recommended serving is not enough for serious issues like Ulcerative Colitis. Here is a study that reported positive results using 3,600 billion bacteria per day. This dosage is a few times the serving size, and this is one of the reasons they recommend being supervised by a physician. Make sure you start with a low dose, and you increase your dose gradually. This will help you avoid the side effects. Bacteria in VSL #3 blend does not colonise permanently your colon. So even after a complete remission, you have a great chance to get sick again, when you stop taking the probiotics. The trick is to slowly build your microbiota. You can do that by slowly introducing fermented foods, and probiotic foods into your diet. You should only do this very slowly, and only when you are symptoms free. 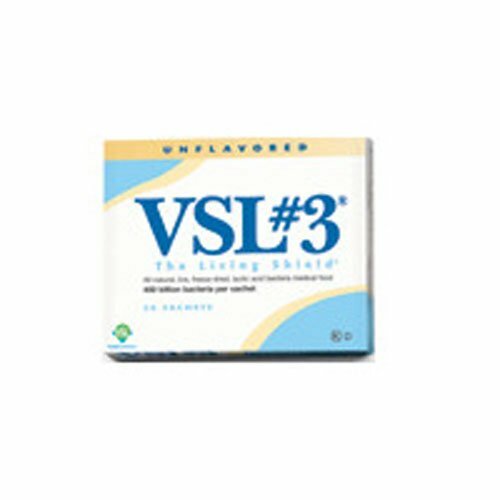 Even when the symptoms have subsided completely, do not completely interrupt taking VSL3. This will maintain your intestinal microbiome in a safe balance. Studies have shown that completely interrupting VSL #3, and going back to the regular diet, will likely result in a relapse. The relapse will milder than initially, which suggest VSL3 has long term effects, but if not treated, will eventually get worse. Here is the study. Eat various foods, from sour pickles to miso, tempeh, kefir and yogurt; you can take a look at this fermented foods list for inspiration. Your prebiotic foods should include all types of prebiotic, not just one type. Take a look at this comprehensive list of prebiotic foods, for ideas. Info about the best-selling, top rated probiotic supplements, the list of strains, and other components in their ingredient list. The list is based on Amazon ratings and selling numbers, and our research, and is meant to help potential buyers to choose a probiotic. Which one is better, VSL #3, or Align. The two probiotic supplements are the best for treating IBS and other GI issues, but the two supplements approach the treatment differently; Align uses sniper precision, with a unique dose that can treat various gastrointestinal issues, whereas VSL #3 uses brute force, using the principle if the regular dose doesn't work, double it, or triple it. Choosing the best probiotic supplement could be a challenge, especially when we don't know all the supplements on the market. We compiled a list of probiotic supplements, that contains the most popular and trusted supplements, and are relatively easy to buy. All these are over the counter, and are relatively safe to use, and permanent side effects are virtually inexistent. We can't give you any medical advice. This is informational only, and you should discuss these with your doctor. VSL#3 certainly helps. You can add in the mix Lactobacillus casei which was scientifically proven to help with diverticulitis. Any anti-inflammatory will help with the inflammation, use natural ones. Eat soluble fiber with your probiotics, (prebiotics). We have a few of articles about prebiotics, read them. Introduce more fiber gradually, and eat various prebiotics, not just one type. I took VSL#3 for years until it failed me a couple months ago. I found out they changed the formulation and added corn starch and other things. They are making it in Italy instead of USA. Call Medical Div of VSL3. They are receiving complaints. Changes took place in 2016. The original developer of product sold as VSL3 left company and took his formula with him. It is being sold as Visbiome and is the actual original formula that VSL3 was when it worked. Thanks for the heads up Henry. Did you try Visbiome yet? This sounds fishy to me - the developer could not leave with his formula. Can I open capsule and take formula in applesauce? Absolutely. You can open the capsule and take the powder as is. But you can also buy the sachets, and take it that way.